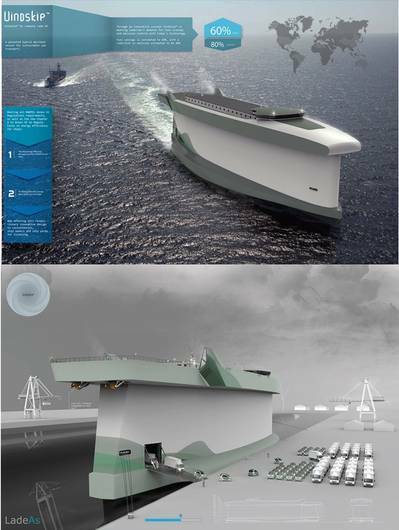 Vindskip from Lade AS is a patented hybrid merchant vessel designed for sustainable sea transport. The designer claims potential fuel and emission savings of 60% and 80% respectively, courtesy of the highly unusual hull shape that is designed to essentially act as an air foil. It’s designer claims, through information available on its website at http://www.ladeas.no that the design meets all MARPOL Annex VI regulation requirements, as well as the new chapter 4 to Annex VI on regulations pertaining to energy efficiency.